Alegria Gardens is excited to announce the opening of our second wedding venue location in Katy! We’ll be holding a special Grand Opening event on Oct. 28 from 12:00 p.m. to 6:00 p.m., so be sure to stop by and see our amazing new location for yourself. For the last decade, Alegria Gardens has been Katy’s go-to destination for party receptions. From ornate weddings to classy quinceañeras, Alegria Gardens has hosted thousands of events in our history. As the Top Rated Local® reception hall in Katy, Alegria Gardens stands out for much more than just our venue. Indeed, we strive to make it easy for our guests to plan events of their dreams. Party planning — we have a team of party planners who will worry about the little details, so you can just enjoy your special day! Catering — don’t worry about needing to hire outside vendors for your reception. Our in-house team has an incredible menu from which to choose. Transportation — looking for a limousine for your event? Our wedding venue features transportation options so you have one less thing to think about. Flexible event spaces — no matter the size of your event, our reception hall can take parties of any size. We can create intimate, small gatherings and also support large weddings. Music, photography, and video — we have DJs who can play music you choose or create an appropriate and entertaining playlist for your event. In addition to music, we also have professional photographers who know our venue really well. Finally, we have videography as an option so you can relive this special day for years to come. 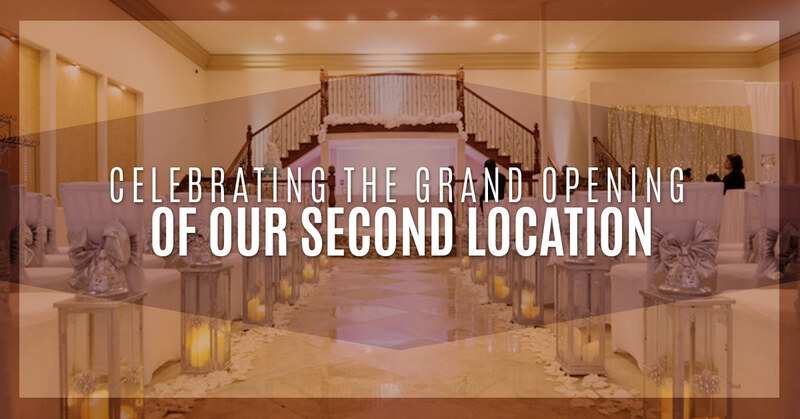 Now, as our second location opens, you have two Alegria Gardens reception halls from which to choose. Each venue location offers these services that make Alegria Gardens such a popular reception hall. Curious as to whether our two Alegria Gardens reception halls can meet your needs? Call us today to speak with a member of our staff! The Grand Opening Event on Oct. 28 is a chance to both celebrate Alegria Gardens and to introduce potential guests to our staff, vendors, and planners. A huge part of planning a successful event involves having positive working relationships with your reception team. Get to know our team now, and see just how much better that’ll make planning your party! Plus, you’ll get a sense of everything our wedding reception can offer. If you want to attend our Grand Opening event, be sure to RSVP online today! The event is free, but we anticipate spaces to fill up quickly. We can’t wait for you to see our newest piece of Paris in Houston.